Have you ever tried to take a shower and realized that your head is about to touch the shower head? Odds are high that this was an uncomfortable situation and you're probably looking for a way to fix this, but how? Luckily for you, you can get an adjustable shower arm extension which will allow you to both lower and raise your shower heads height. 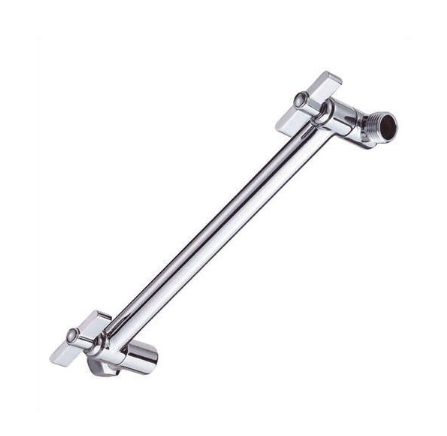 The real question which it comes down to is, "what are the best shower arm extensions to get in the first place?". I've put together this entire buyer's guide after doing my own research. To give you a quick perspective on why I decided to write about this (as boring as it may sound), is because I moved to a different country. When I moved, everyone around me on average was shorter by at least 6" inches or more. After getting my own apartment and seeing that my head matches the shower head height... I HAD TO make a change, so that is why you see this entire buyers guide catered towards shower head extensions. Below you'll find a chart summarizing the TOP 4 picks, and also at the bottom you'll see them with more detailed reviews. Why, Are They Really Necessary? After You Buy, How Do You Install? 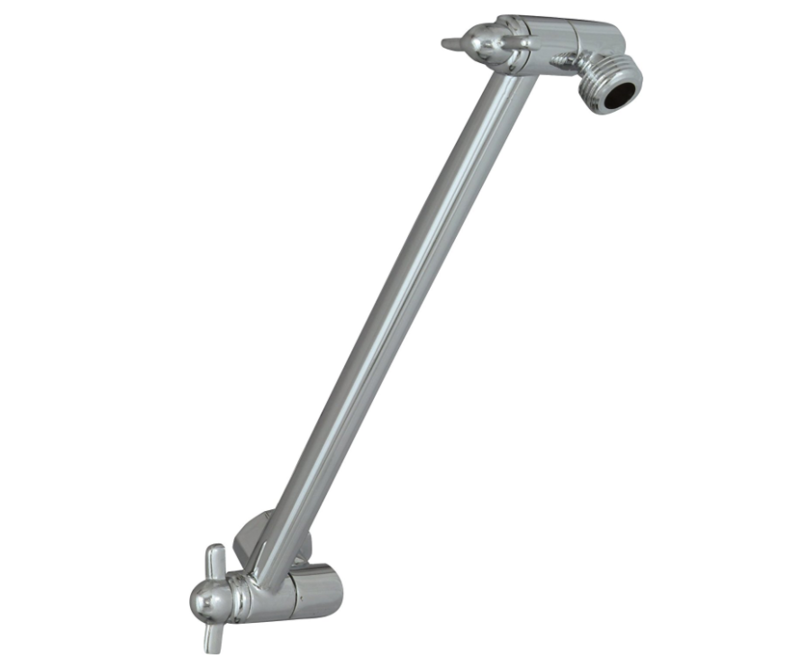 The use of a shower head extension arm serves two purposes, to accommodate your own height and to have flexibility to adjust and tilt your shower head any direction you desire. First one would be a true MUST while the second one would be something you simple COULD have as an extra. Is your height really giving you a hard time when showering, such as you being too tall or maybe even too short requiring you to bring it down towards yourself? Could you use more flexibility for yourself or maybe someone else in your household that uses the same shower? When you answer those two questions, you'll know with certainty if an adjustable shower head arm would be something you need. 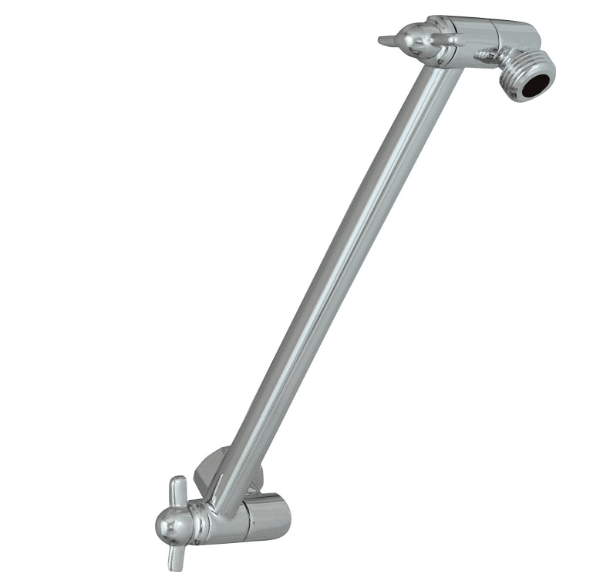 If you want the BEST of the BEST adjustable extension arms, you must go with Delta's UA902-PK. I've dug through the most popular ones and the conclusion I came up with was, THIS has to be the most recommended. You get 10" inches in total additional length. You can adjust in four different areas for a full 360 degrees. The entire unit is made of durable brass, coated in chrome. You pay less than 20 dollars, but get much more in value. This thing is quite remarkable, and to be quite frank... there's a few that come close. But someone had to be #1, so Delta Faucet's product made it on this list. Please, I strongly urge you to check it out online and grab it while its on sale. If you have an issue with the height of your shower head (whether short or tall), take this unit into strong consideration. This one for me was a tough call, should I make it number one or should I make it number two. Because of its newness, I had to bump it down towards the #2 spot. 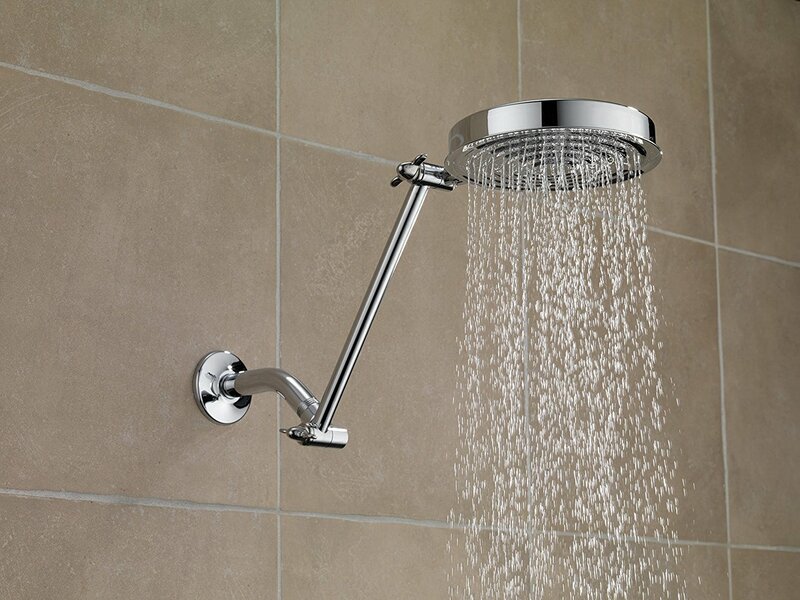 Nonetheless, the AKDY 11" shower head extender will not disappoint. If you're the type of person who needs help with your height in the shower and don't have much to spend, worry no more. 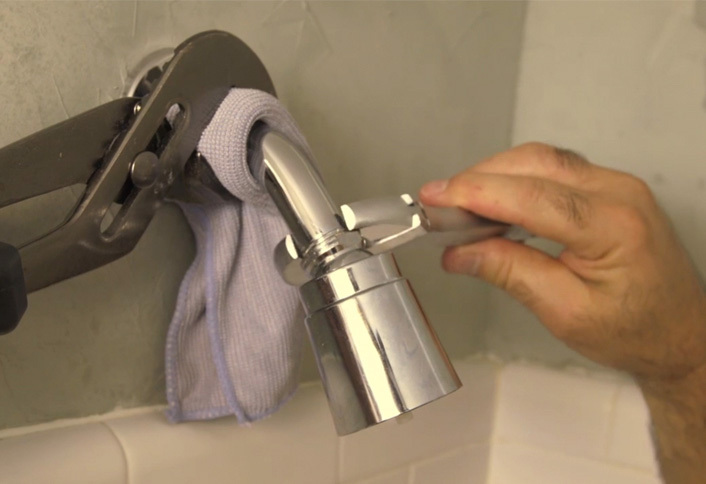 This arm can extend your shower head up to 11" inches more. There's four swiveling areas where you can adjust the direction of where your shower head is pointing. Made of durable brass and coated in chrome. You pay less than 15 dollars for the entire unit, which is the cheapest on this list. Durability and affordability, it's one of the best combinations when it comes to shopping for things. If you don't want to spend the few extra dollars with my #1 pick above, this is your cheapest option. From a few hundred individual user ratings, it has proven to be a good pick for the purposes mentioned earlier. Check it out, don't wait! How about we have some variety in this mix with Aqua Elegante's beautiful shower extension. By comparison to the two mentioned previously, I think this one really makes things look different (for reasons I'll mention below). This is the product you need if your bathroom needs a more unique color scheme. Chrome or brushed aluminum can get old quickly, so getting a color that shakes things up a bit can be a good thing. To be clear, this would be an ideal extender arm if you need a darker color to match the colors of your bathroom, shower accessories, and anything else you desire. You can extend this unit up to 10" inches into any direction. Unique to many others, with Aqua Elegante, there's three colors to choose from such as Oil-Rubbed Bronze, Chrome, and Brushed Nickel. 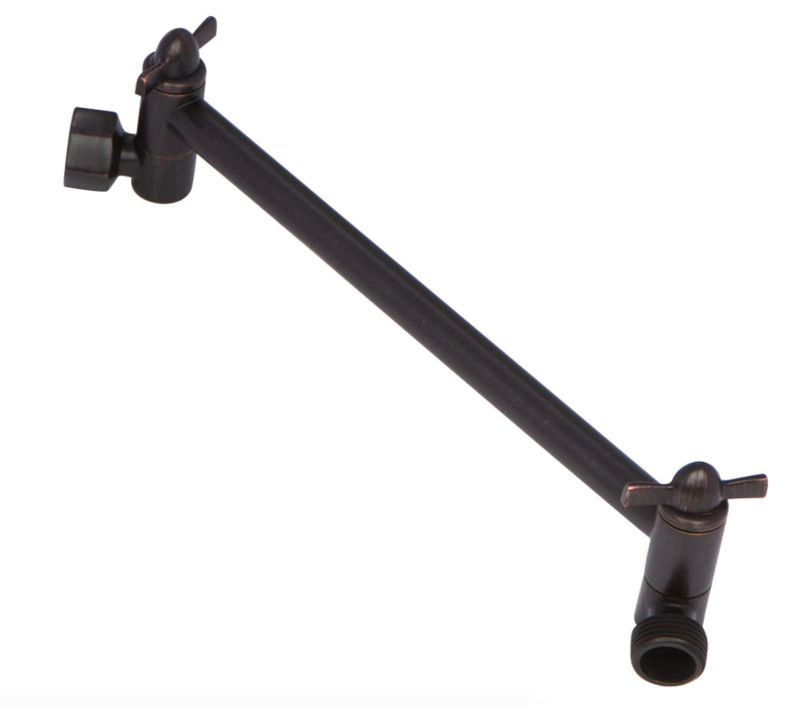 The entire arm is made of reinforced brass, making it a very durable unit. Reasonably priced at just under 30 dollars, a good deal if you're looking for something unique. In a nutshell, this is the most unique extender pipe I've reviews to date. None of these so far cost a significant amount of money, even the difference in cost is more or less 10 dollars which shouldn't be a deal breaker for almost all. Do look into this one! We have reached the #4 top pick in this list. 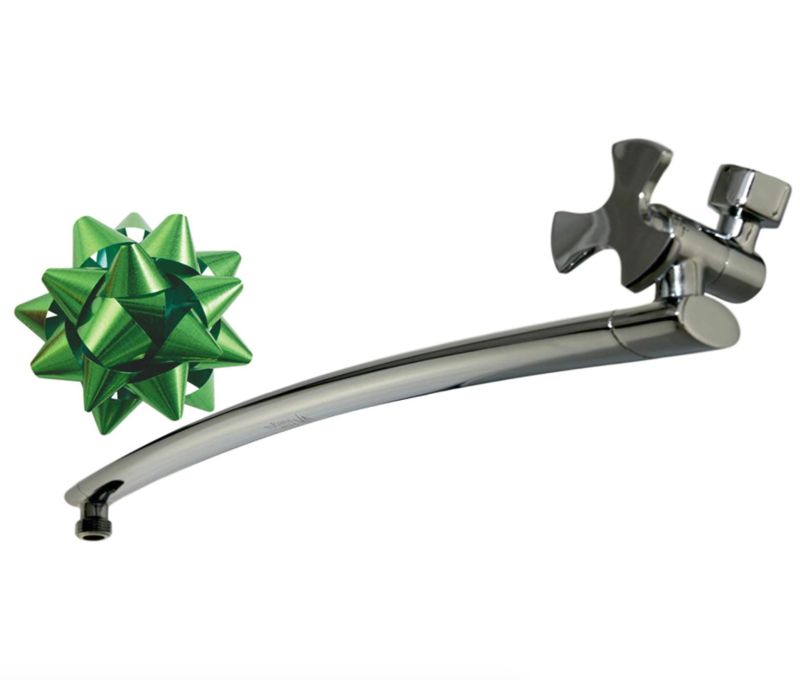 Here we have the Vida Alegria REACH-CH brass shower head extension arm. This thing is a monster, by comparison to the other ones I wrote reviews on. Before I go any further, I'd like to point out WHY this is on my list. As you can see, the whole list above consists of arms that reach no more than 11" inches outward. This can sometimes cause a problem such still being too close to the wall for a bigger individual or, even reaching all the way up... in rare instances, 10-11" inches won't make a shower head high enough. That's where this one comes into play. Forget about 10 or 11 inches in length, this product can do 18" inches out. If you are in need of different colors, this one has you covered with chrome, nickel, and oil-rubbed bronze. Made of solid brass for long term durability. It can handle high water pressure and flow, upwards of 7 gallons per minute and 750 psi combined. So in summary, while you pay more here, you get a bit more with a solid history to back it up. If you need something much longer than mentioned in the previous 3, this one by Vida Alegria is for you! If you got this far in the guide, I congratulate you my friend. Odds are you probably are going to buy yourself an extension pipe that fits your needs (as most would), and then the question remains: "How do I install this?". I'll explain in a few easy steps what you can do to have everything read in a few minutes or less. This step seems very straight forward, but some people throw away some things that seem "unnecessary". These things can sometimes be: washers, odd looking screws, stickers, zip ties and many other things. It will be important to follow the instructions provided in the box to ensure the small stuff goes into the right places. This may require the use of an adjustable wrench, or maybe just your hands. Whichever way works for you, unscrew your old shower head and prepare to screw on the new extension arm. This is where leaks can start occurring easily when not done properly, some products come with teflon tape (while many others don't). In the even that you don't, just go to your local hardware store and buy a roll of teflon tape. After purchasing it, wrap teflon tape on the threads of the extension pipe and the old shower pipe that is coming out of the wall (making sure to wrap the tape into the same direction you tighten). Some can get carried away to put the weight of the world on shower head threads. Don't be that guy or gal. Hand tighten your shower head but make it to where you can also un-tighten with relative ease.